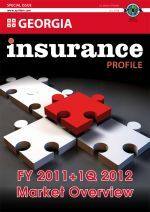 This special issue of Insurance Profile, dedicated to Georgia, is an editorial premiere meant to be an efficient tool in your hands, trying to asses the market’s accomplishments and to emphasize the real business opportunities. It is not only about the potential of a young market, but also about the real needs of a fast developing economy and the efforts of the main market players to make big steps ahead, achieving a high professional standard, developing sound and profitable business and… why not, building a new mentality in what people’s economic behaviour is concerned. Beside the well known beauty of the Georgian landscapes and the richness of its culture, you can get acquainted with an industry which is part of a financial sector recording in 2011 the highest dynamic in the country, of over 24%. How much of this growth came from the insurance market and how much growth space has this market in the future years, you will find out by reading the following pages. P.S. If you need to be permanently well informed about the Georgian insurance market, as well as about the other markets in the CEE and CIS regions, visit www.xprimm.com and get the latest news and statistical data.